I really loved Alex Well’s space punk, biker, science fantasy novel Hunger Makes the Wolf. It was truly one of a kind, involving so many different elements yet forming a seamless whole. 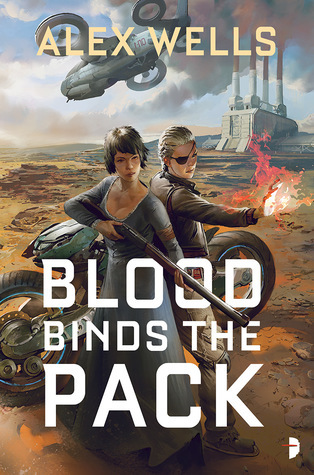 I’m happy to say that Blood Binds the Pack is a fitting sequel. Note before I dive into the review — this will contain spoilers for Hunger Makes the Wolf. Also, the books are best read in order and I don’t recommend reading Blood Binds the Pack first. Hob and Mags have dealt a blow to TransRift, destroying one of their Weatherman. Of course, the next one is now bound for Tanegawa’s World along with orders from corporate HQ to throw everything they have at obtaining more of that strange blue mineral found by Mags’s father. And as always, TransRift sees the miners as tools to be used and disposed of in pursuit of the profit margin. Hob and Mags may have won the last battle, but the war is just beginning. However, they may have some possible help. Shige’s received word that a government inspector is being sent to Tanegawa’s World for the first time ever. His orders are to make this as bad as possible for TransRift… of course, Shige’s general approach is “the ends justify the means,” so it’s questionable whether or not he’ll be helping or making things a heck of a lot worse for Hob, Mags, and the workers. At the beginning of each chapter is a number counting down how many days until the inspector is supposed to arrive on the planet. As the number drops, tensions rise. About half way through the book, I was having serious trouble putting it down. Mags and the miners start organizing a strike and TransRift is NOT taking it well. Labor rights is an issue threaded through the book. While science fiction takes place in the future, it of course tends to reflect the problems of our present and past. The dire future laden with corporate abuse Wells creates is hardly unimaginable (or even that original when it comes to sci-fi futures), but Wells gives it an unique flavor. For one, mercenary bikers! Hob’s biker crew is pretty great, ya’ll. I want to reiterate how much I love Hobs and Mags. Hobs is that tough-to-the bone sort of female protagonist, no nonsense, a straight forward badass. It’d be easy for her to be a stereotypical Strong Female Character, but Wells gave her enough development to be well rounded and distinct. It helps that Hobs (and the other characters) all have such distinctive voices. Mags is a quieter sort of character but no less memorable or powerful. Something happened to her in the TransRift labs last book, and she’s beginning to experiment with her own witchiness. Also, I was totally right! Mags gets a romantic subplot with another female character. I was thinking it would happen, and I’m so glad Wells proved me correct. I don’t think I talked about it enough in my review of the first book, but I love the strength of Hobs and Mags’s friendship. It’s undoubtedly the most important relationship in a book, which makes a nice change from the preponderance of romance being put on a pedestal about friendship. It’s unfortunate that female friendship is so rare in science fiction and fantasy, but I’m planning to recommend Hunger Makes the Wolf to counteract that. Blood Binds the Pack is a fantastic follow up to Hunger Makes the Wolf. I think there’s room for a third book if Wells ever wants to write one, but the two books could also stand alone as a duology. Regardless, I’m going to read whatever Alex Wells writes next. On the surface a story about labor rights doesn’t seem like it would be that interesting, but this series sounds really good! It is! And it looks like the author is basing it off of/was inspired by some historical events? The Ludlow Massacre in Colorado, which looks interesting all on its own (if bloody). I’ve got an interview with them going up too! And yes, I love badass female protagonists too.